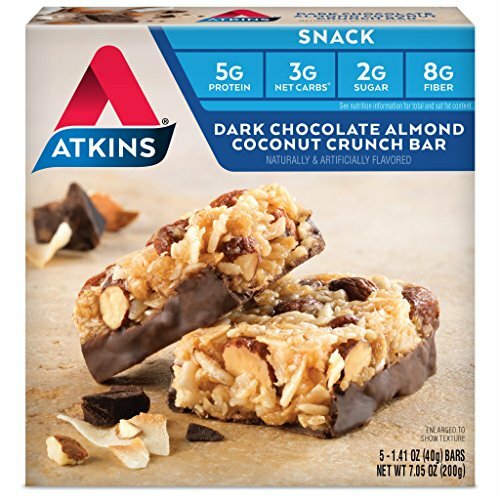 Atkins Dark Chocolate Almond Coconut Crunch Snack Bars are a decadent combination of crunchy almonds, sweet coconut, and a smooth layer of dark chocolate. 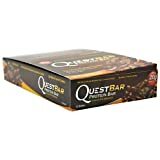 This snack bar packs all the nutrition your afternoon needs with 7 grams of protein, 2 grams of sugar and 10 grams of fiber per serving. Plus, they have 4 grams of net carbs, making them great for a low-carb lifestyle. Includes one box of 5 snack bars. The Atkins Diet and Lifestyle provides quick, effective, and balanced weight loss by limiting carbs and sugar to help the body burn fat for fuel and keep your energy steady. With over 80 published clinical studies to support the principles behind the Atkins Diet, we provide filling and delicious snacks to help you stay on track!